Fixed star Acrab, Beta Scorpii, is a 2.6 magnitude triple, pale white and lilac star on the head of the of the Scorpion, Scorpius Constellation. 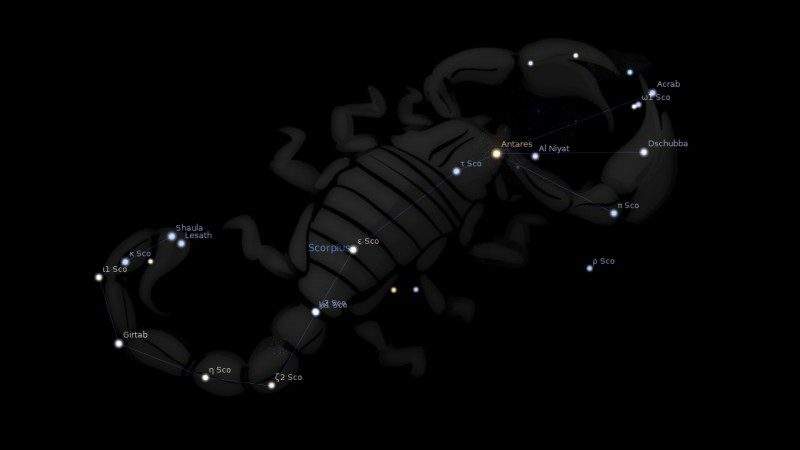 The traditional name Acrab comes from the Arabic word العقرب (al-‘Aqrab}, which means The Scorpion, for the whole constellation. Another name for β Scorpio is Graffias. Beta Scorpii appears on the flag of Brazil, symbolising the state of Maranhão. Acrab and the Forehead of Scorpio, both in constellation Scorpio, and positioned next to each other, are supposed to correspond to a Mars character with a blend of Saturn characteristics. Dr Koch is of the opinion that both these stars are doubtful; the effect of these two stars has yet to be researched more fully. According to tradition, these fixed stars are credited with giving the ability to do research, especially into things of a particularly secret and hidden nature. For this to be however, further influence of the sign Scorpio and planets Mercury and Uranus have also to be present; preferably these stellar bodies would be positioned on the Meridian or Asc and be near another stellar body pointing to mental capabilities. In lower types, however, a tendency to falsehood and treason can be noted. Both stars are a poor augury for material wealth. There will be difficulties, impediments, or loss, dependent upon the position these have in the cosmogram. In mundane maps, there is an indication of mass catastrophes should Mars, Saturn or Uranus be in these first degrees of Sagittarius, especially in an angular position. Jupiter conjunct Acrab: Hypocritical, real or pretended religious zeal, legacies attended by legal difficulties. Amy Winehouse 1°21′, Hillary Clinton 1°57′. 1. Fixed Stars and Constellations in Astrology, Vivian E. Robson, 1923, p.169-170. 2. Fixed Stars and Their Interpretation, Elsbeth Ebertin, 1928, p.65-67. 3. Star Names: Their Lore and Meaning, Richard H. Allen, 1889, p.367. 4. The Fixed Star Health and Behavior Imbalance, Ted George and Barbara Parker, 1985, p.102-103. 5. Fixed Stars and Judicial Astrology, George Noonan, 1990, p.47. What does the conjunction with North Node mean? I have it at 3º03′ Sag. The cusp of 12th house is very close as well, at 2º29′. For the Nodes, it’s best to combine the Sun and Moon interpretations. What does it mean when your descendent conjuncts Acrab? Mine DC is at 3 degrees Sag! Well DC represent your partnerships, whether lovers or open enemies. So I would loook at the interpretation for Ascendant and apply it to those people in your life. Hi Jamie! Amazing work with the fixed stars! At the top of the page, it reads that “Acrab is at 03°12′ Sagittarius with an orb of 1°00′ “, then further below in the list of fixed stars it is given an orb of 2 degrees? So I was just wondering which one it is.. Btw, your website is the only site I have found online with exact orbs for the fixed stars! Much thanks for that & greatly appreciated! Thanks for pointing that out Roberto and I’m glad to hear you appreciate these pages. It is 2 degrees and I have fixed up the error. I use the orbs suggested by Eric Morse in his book The Living Stars. They are based on apparent magnitude. I have my Draconic Sun tightly-conjunct natal Moon on Acrab, how can that be interpreted? Just Moon conjunct Acrab because I’m not sure how Draconic planets apply to the fixed stars. I have found that often criminals have planets in Sagittarius: Check Robson: Graffias causes extreme malevolence, crime, malice, theft, dishonesty, conning and greediness. Just being acquainted with these types makes one wonder how humans can be so unkind to their friends and acquaintances. I have seen how these low types cause grief and desperation to loved ones who they took advantage of. conjunction with Graffias is troublesome with all planets and nodes. Hello Jamie…I haven noticed that both of my kids have their Ixion conjunct Acrab…and because Ixion is so slow…I would guess that many of us have inner Ixion challenges..that if conquered within..would arise on the outside…and this conjuct coming into tighter orb..among 17 and 19 year olds…Of course depending on the rest of the chart to determine the natives ability to handle the karmic tests I guess.. I was studying this star..and as you may know if you are an astrologer..or a student..if you wonder about something..you will be led..to notice several important points concerning the star..
One is that yesterday Nasa reported the landing of the robot INSIGHT on Mars..The Houston chart for this..has Jupiter conj Sun aligned with ACRAB with Mercury also within orb. And THEN I looked up Helen Duncan’s Chart..the last person to be imprisoned for false witchcraft…and listening to a documentary..she was brutally discredited after a spirit appeared informing the audience of the recent sinking of a large military ship..which had been a military secret. This explosive proof of her abilities..with the combined exposure of a military secret…SO..they had to discredit the crap out of her.. Which to me points to the psychic ability to grab information..(the pinchers of the Scorpion)..this was all in her 3rd house..